Be the first to share your favorite memory, photo or story of Shaun . This memorial page is dedicated for family, friends and future generations to celebrate the life of their loved one. 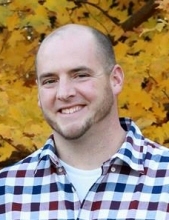 Shaun L. Bradbury, 36, of Freeport, passed away, Sunday, February 3, 2019. Shaun was born October 3, 1982, in Freeport, the son of John and Cynthia (Crawford) Bradbury. He married Amanda Nieman October 20, 2007. Shaun was a 2001 graduated of Freeport High School, where he was a member of the football and basketball team. Shaun was well known for his famous catch that propelled the Pretzels to a dramatic homecoming victory over the Boylan Titans. He enjoyed hanging out at the lake and boating with family and friends, woodworking, spending time with everyone he cared about; but most of all being with the loves of his life, his wife, Amanda; and their daughters, Kamryn and Kalli. He was an avid Chicago Bears Fan! Shaun was a member of Faith United Methodist Church. He worked as a technician for Galaxy One. Shaun was an extremely hard worker that could fix about anything and was never afraid to lend a helping hand. Surviving are his parents, John and Cynthia Bradbury; wife, Amanda Bradbury of Freeport; their daughters, Kamryn and Kalli Bradbury; brother, Nicholas Bradbury of Freeport; sister, Laura Bradbury and Karen (Jeff Sloan) Bradbury; mother and father-in-law, Beth and Randy Nieman; brother-in-law, Cory (Kenzie) Nieman; grandparents, Robert and Nancy Crawford; Russell (Lorraine) Nieman and Karen Vehmeier; two nephews, Collin Heidenreich and Sawyer Nieman; two nieces, Kaylynn Heidenreich and Eila Nieman; his dogs, Barkley and Madden; and many aunts, uncles, and cousins. Shaun was preceded in death by his grandparents, Gene and Corrinne Hamon and James M. and Josephine Marie Bradbury, and Larry Vehmeier. To send flowers or a remembrance gift to the family of Shaun L. Bradbury, please visit our Tribute Store. Visitation will be 3:00 p.m. – 7:00 p.m. Thursday February 7, 2019 at Faith United Methodist Church. Following the burial on Friday February 8, 2019 there will be a Celebration of Life from 2:00 p.m. – 4:00 p.m. held at the Wagner House (2nd floor) for family and friends. "Email Address" would like to share the life celebration of Shaun L. Bradbury. Click on the "link" to go to share a favorite memory or leave a condolence message for the family.